Our skin is an amazing layer that protects us from harm, and yet it is remarkably thin. The skin as we see it is made in the basement layer of the Epidermis, and is only a millemetre or two thick. 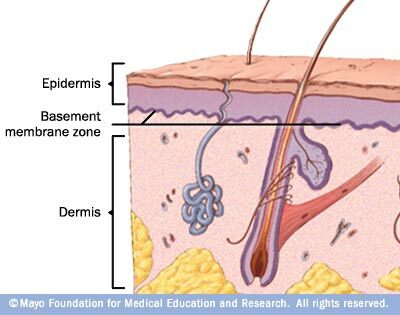 This is also where our melanocytes cells are that give us our suntans. Below this is the Dermis, containing our hair roots, sweat glands and, very importantly, the fibroblast cells that make collagen and elastin. Obagi Cosmeceutical Creams – The Obagi range is the gold standard in skin care. These are specialist skin creams which only doctors can prescribe because they are so powerful. Google “Obagi NuDerm” and see what users think! Dr Obagi is a famous dermatologist who over many years has perfected a range of treatments for all skin types which he uses to prepare skin for an effective deep skin peel. Indeed the creams can be so effective in rejuvinating the skin or treating hyperpigmentation problems that people often choose to continue with the creams rather than have the skin peels. Dr Blatchley has perfected a special cut-down version of the NuDerm System for people who do not need the full system and just want to rejuvinate the skin. This makes it simpler and cheaper to use with only one application at bedtime. Decolletage – Your chest is such an important area and a crinkley cleavage is a real giveaway of age. The the skin is thin and easily damaged by UV from the sun. Elastiderm for Decolletage is prepared specifically for the cleavage area and incorporates hydroquinone to lighten the skin and Elastiderm to stimulate collagen and elastin production. Alternatively for a stronger effect you can use the NuDerm System. Hands – Elastiderm for Decolletage is also very effective in improving the skin on the back of the hands. 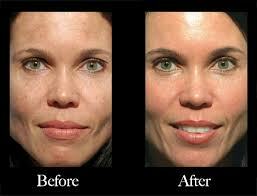 The hydroquinone lightens the age spots. You can also have Radiesse filler to replace the lost volume to the back of your hands, and they will look even younger. light fruit acid peels – ‘lunchtime peels’ – are great as a tonic and have no downtime. They are more of an exfoliation than a true peel, similar to microdermabrasion. strongest peels such as the Obagi Blue Peel remove the outer layers down to where the new skin is made. They are far more effective in rejuvinating the skin, so much so that they are used to repair acne scarring and hyperpigmentation, but they do require 2-4 months of preparation with Obagi cosmeceutical creams before the peels are applied. These will be prescribed by Dr Blatchley after a full clinical assessment. However the effects are stunning!